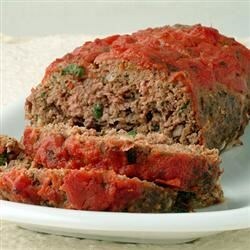 "This is a great alternative meatloaf for people on high-protein low-carb diets. It tastes delicious, and one serving keeps you full for hours! Great with a salad!" In a large bowl, mix together the ground beef, Worcestershire sauce. tomato sauce, crushed pork skins, and eggs. Season with chili powder, garlic salt, and garlic pepper. Mix until well blended. Form into a loaf, and place into a greased loaf pan. Bake, uncovered for 35 to 40 minutes in the preheated oven. Let stand for at least 5 minutes before slicing and serving. Meatloaf is very salty! I would use maybe just regular powered garlic next time instead of the seasoned salt. I never add the pork skins. Adding filler to meat loaf was started to make the meat stretch not in enhance the flavor. I add lots of chopped fresh mushrooms, onions, and red peppers. Did not form a loaf at all, and I used over a cup of crushed pork skins. Its close to a loosemeat than meatloaf.